I use tons of rubrics. That’s just part of being a teacher/facilitator for a New Tech Network school. 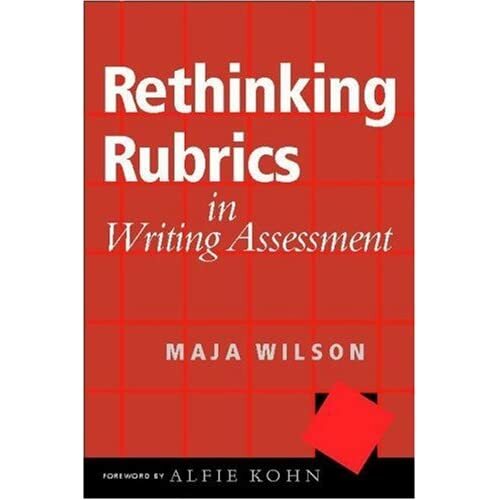 I chose to read Rethinking Rubrics in Writing Assessment by Maja Wilson in order to help guide my goal of better assessing student writing as I continue to grow into project-based learning (PBL). Earlier in the year, I finally “got” the literacy task format that New Tech Network had suggested — its purpose, strengths, etc.. However, when I tried to use a pre-written rubric (and a seemingly solid one) for a large-scale research essay, I found myself pretty stumped by how little I was able to communicate. Upon reviewing the piles of essays, I took a moment to think about how my students would interpret their final, graded products. Some, I knew, would see the high marks and not know things were over. Others would see the marks along the scales and know their work had paid off, but maybe they had not been challenged in the first place. One can go through and make a list of personality types in this manner. However, the one that makes you sit back and think is the one essay that does more than the rubric can handle. The piece demonstrates growth, effort and thought that makes you stop and think about why you need to grade it at all… the work is an accomplishment itself. Maja Wilson uses this premise to frame Rethinking Rubrics before going into the history of (mostly standardized) writing assessment in the United States. Wilson was troubled by one piece of writing that followed the prompt to some degree, but did not follow the execution parameters of a holistic rubric provided by the Michigan Education Assessment Program (MEAP). After concluding in the first chapters that “Writing assessment became linked with ranking to allow certain students tinto universities and to keep other students out” (p. 26), Wilson throws quite a few punches at the 6+1 rubric model before taking a couple shots at the MEAP. Clearly (through many pages) readers find reason after reason that Wilson’s student sample of writing is a moving, yet poor-ranking piece of writing according to her state-provided holistic rubric. Through the chapters, Wilson problematizes the use of rubrics. Each chapter is truly a glimpse into what goes on when a high school English department tries to use a holistic rubric to simulate a practice test — a scene I lived through myself at my last school. In a large room, all of us had gathered to anchor and then assess timed student essays, and, boy howdy, was it rodeo. One of the UIWP demos by an Advanced Placement (AP) teacher a couple weeks ago certainly now reminds me of how, as a blind rubric-marking evaluator, I could still sniff out the AP students who had the format drilled into them. As English teachers, we learned a lot about the loopholes in rubrics, as Wilson sure has, but we left the conscience-challenging essays to fall where they would at the end of the day (only for some teachers to override the scores a week later when they were returned). Rethinking Rubrics in general spends too much time on the problems, however, and doesn’t tell me much about how teachers can cultivate better writers in a school environment that expects rubrics to be part of the classroom experience. Wilson misses out on the opportunity to provide ways that teachers can communicate their values of writing to student writers. She starts what could be a great discussion of the definitions and connotations of assessment, evaluation and grading (p. 24-26), but does not move into solutions to the problems very quickly. There’s a great visual of the range/characteristics of responses to student work on p.25 where she cites Alternatives to Grading Student Writing by Steven Tchudi. But then Wilson fails to take the opportunity to show how Tchudi’s work could be an outline for feedback that complements rubrics. That is, until the last chapter (ten pages, making up only a tenth of the book), where she briefly goes over some ways to respond to student writing… but again, not grade it. Ultimately, Wilson ends up subtly — without the reader really noticing — tossing rubrics to the wind, not “Rethinking” them. I looked forward to this book for a number of reasons. For one, you always know you are in for a paradigm-shifting treat when Alfie Kohn writes the foreword. Rethinking Rubrics lacks the answers I seek in practice, because I already am aware of the fallout of the policy of bad rubrics. As a reader, I’m left wondering: “What’s been rethought?” I can recommend the book if you need a lightning-rod-type book to organize unpopular opinion around rubricizing, but look elsewhere for texts that might treat the blood-pressure-raising symptoms of using bad rubrics or the head-against-the-wall symptoms of constructing good ones to use yourself. Well… THAT just moved to the bottom of my TBR pile, though I’m not ready to cross it off of my list entirely. I wish assessment was something I was at peace with, but I’m not– not even as a Second Grade Teacher. It is such a slippery slope. I can’t fathom what it must be like for you. I am curious to hear how Becca responds to your thoughts.